In Fairbanks, AK on a not too cold evening atop Murphy Dome with Ronn Murray Photography Tours to learn a bit about Aurora Photography. We departed from the hotel around 9:30pm and together with 5 other “Aspiring Aurora Photographers” I was treated to a detailed lesson in; aurora photography, the science of auroras and a great light show (complements of mother nature.) Ronn and Marketa were awesome! 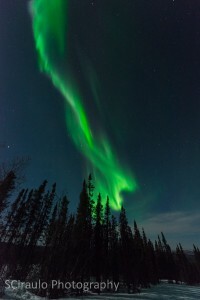 Full of information on camera settings, equipment recommendations and logistics associated with cold weather photography and how best to shoot the “northern lights.” Their expertise, experience (they’ve been photographing the aurora for seven years!) and their welcoming personalities made for an informative and thoroughly enjoyable experience! Returned to the hotel at approximately 3:00am totally wired and “stoked” about shooting the northern lights. The Aurora bug has definitely bitten!